As many may know, I’ve joined Shelby’s reading challenge-read 35 books in 2012. The challenge is not easy, especially when you realize that to stay on target roughly 3 books should be read a month, but I’m trying to hang in there. 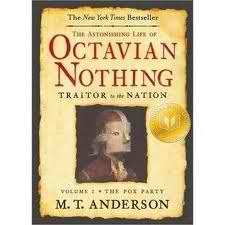 Tonight I finished my third book The Astonishing Life of Octavian Nothing, Vol 1: The Pox Party. Octavian is the son of African royalty, Princess Casseoipeia, who resides at the Novanglian College of Lucidity right before the onset of the Revolutionary War in Boston, Massachusetts. The tiny college prides itself on aggressively pursuing all matters of philosophical, mathematical and scientific exploration. They conduct numerous experiments (How much mercury does it take to kill Octavian’s new dog? ), records everything (such as noting what/how much Octavian eats then weighing his feces), and Octavian is there alongside the scholars being taught their ways, arts and languages of the fascinating world while being treated as the Prince he is. Simply put, he gets the best of the best. Princess Casseoipeia, the only woman at the college, is greatly admired and held in high esteem as well. Unfortunately for Octavian, she refuses to tell him anything of his early life before the college or of her life in Africa. When Octavian goes through serious measures to discover his early life what he learns will SHOCK you! As Octavian discovers more about his past, his current role, and what is in store for him while attending the twisted college the novel takes on a whole new life of it’s own. Despite the heavy Old English vernacular that is a bit challenging, I was able to catch on with no significant problems. I managed to finish the 350 page novel in three days! I encourage you to DEFINITELY go find this novel and dive right in.